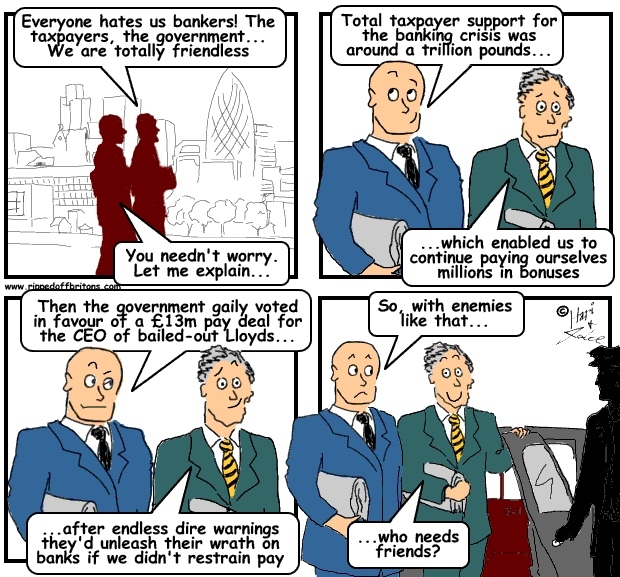 The UK government’s sale of the first tranche of Lloyds Banking Group shares, bought in 2008 to bail out that crashing bank, exposed how we ordinary taxpayers are being soundly ripped-off once again. Inflation has been running well above target for most of the five years since 2008. This has been driven not least by the government's Quantitive Easing policy. Office of National Statistics RPI inflation data shows inflation between 2008 and 2013 has totalled to 15%. This means the value of 73.6p in 2008 with 15% inflation = 85.2p in 2013. The cost to the government of borrowing the bailout money can be calculated from the government bond yields. In September 2013 the 10 year UK government bond cost 2.92%. Therefore, just to break even the Lloyds Bank shares should have sold at 96.4 pence (85.2p + 11.3p). On this basis far from any profit, by selling at 75p instead of 96.4p, we the taxpayers have made a 22% loss! Even that is only part of the rip-off. "Buy low and sell high" is the common advice given to traders. Buy your investments when the price is low and sell when the price is high, and the profit is yours to pocket. Buy a wrecked house at a bargain price, renovate it and sell it at a premium. Buy a wrecked bank at a bargain price, resuscitate it and sell it at a premium. We should not be expecting to sell Lloyds shares at a 'break-even' price. And yet we, the taxpayers, are being made to sell the healthy bank to institutional investors for 22% less than it cost us to buy the wrecked bank! Mr Newmark: the US bank bailout seems to have been a success. The American taxpayer effectively went in, got out and made returns of up 15%. Do you think that the UK taxpayer will get similar returns? If not, why not? Do you think effectively that we ended up overpaying for the UK banks? Michael Cohrs (a Bank of England director): Given where we are today, I do not think that the taxpayer will get those types of returns. Mr Newmark: Do think when the bailouts happened that we overpaid? Do you think when we ended up buying the banks early on that we ended up overpaying, unlike the US Government? ‘‘I remember being summoned out of the meeting to talk to Tom McKillop [then chairman of RBS] and he said things were just terrible, that money was pouring out of the door. In 2008, amid all the panic and incompetence, the Taxpayer was made to buy crashing bank shares at a high price. In 2013, in the cold calm light of day, the Taxpayer was made to sell low. Doubtless this will continue in the coming months, as the remainder of taxpayer holdings in Lloyds and RBS are sold to the private sector on the cheap. 1)you don't add inflation and the cost of borrowing. 2)you don't use 10yr bond yields in sep13 to calculate the cost of financing the position. The loss is actually bigger than you state. why not base rate? why not the 3yr rate? why not the 5yr rate? @BlackRaven so in your opinion did we get a profit on this deal? If so how much? "Taking account of the cost of borrowing the money to buy the shares, there was a shortfall for the taxpayer of at least £230 million." "1)you don't add inflation and the cost of borrowing." - yes you do silly. If you bought something for 73.6p in 2008, and sold it for 75p in 2013.
a) If you didn't borrow the money, then you would only have lost on inflation. b) If you did borrow the money, then you would have lost on the interest on borrowing & you would still have lost on inflation. Government borrowed the money, so it lost on inflation and in the cost of borrowing (interest). We've also subsidised them and will continue to do so by insuring their deposits allowing them to pay low rates and make bigger profits on loans at customers' expense? Selling Government-owned shares in Lloyds Banking Group could prove as big a mistake as Gordon Brown’s ill-timed gold sell-off of the late 1990s. The alarm has been raised by Lawrence Tomlinson, a multi-millionaire adviser to Cable. Tomlinson said: ‘What’s the big rush? Just because we can get some money back it doesn’t make sense. I would hate to think they do the same thing Gordon Brown did.’ He suggested that banks themselves would not sell shares now if they had financed a turnaround in a similar way. ‘What bank funds a crippled business and sells it back to the market at the original price?’ he asked. The allegation that a sale might compare to Brown’s sale of gold at $300 an ounce will particularly hurt Osborne, who taunted him over the sale. Brown sold 400 tons in 1999 for £2billion. The gold price has surged since, meaning he lost out on as much as £9billion. " National Audit Office report in December 2013 confirms: "Taking account of the cost of borrowing the money to buy the shares, there was a shortfall for the taxpayer of at least £230 million. " (NB Govt doesn't say what the actual price paid was for these sales as far as I know).